My mom recently requested I build her a sofa table since everything she found was either too big or too small. Her size requires were 30" High, 14" Deep, and 46" Wide. As long as I hit those dimensions she didn't care what the table looked like. I took this as a fun opportunity to design on the fly, experimenting with some 'new to me' ideas and tapping into my creative side. Like any project that ventures into weird art, I fully expect some folks to not like it. Heck, I'm not even sure I totally like it. But it did allow me to explore some new ideas and test the limits of this construction method, which could be inherently problematic. 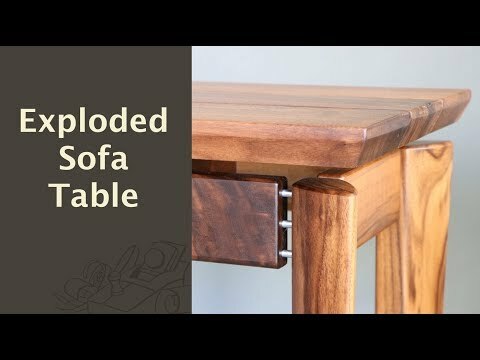 Who knows, maybe I'll start a new line of "exploded" furniture! Or not. But hey, it was a blast to build! I'd like to thank all of the folks on Instagram who contributed ideas during this build process. I'd also like to thank the folks who mentioned that the piece looked like an exploded diagram, as that helped me establish the overall theme for the project. Because of the design on the fly nature of this project, there is no plan.